An old-fashioned sliced sweet potato pie with a lattice crust top. Cover whole sweet potatoes in water and boil for 20 minutes or until soft and done. Remove, cool and discard sweet potato skins. Save 1 cup of the cooking liquid. Cool, then slice enough of the sweet potatoes to yield 4 cups. Line pie plate with 1 crust. Layer sweet potato slices in pie crust, filling to edges. Combine 2 cups sugar with 3/4 of the reserved cooking liquid and pour over sweet potatoes. Add additional liquid if necessary to just cover sweet potatoes. Sprinkle pie with nutmeg and dot with butter. 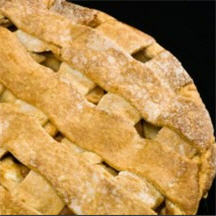 Cut second pie crust into 1/2-inch strips and crisscross on top of sweet potatoes to make a lattice covering. Crimp the pastry edges together. Dust the top of pie with remaining 1 cup sugar. Bake in a preheated oven at 350°F (175°C). for 40 to 45 minutes or until top crust is browned. Cool before serving. Recipe and photograph provided courtesy of North Carolina Sweetpotato Commission.